Immerse yourself in technology while you learn about the opportunities and challenges that exist in the information economy and e-business age. Prepare for career options that include small business ownership and management, retail management, human resources, operations, sales and purchasing, product development, and e-business. Gain a global perspective as you learn with and from students from more than 30 countries. Do you like to plan, organize, lead people or manage resources? The University of Minnesota Crookston's (UMC) Management degree program prepares students to manage business firms, institutions, small businesses and other organizations. The University of Minnesota Crookston's (UMC) online degree in management has been ranked among The Best Colleges list of "Top 10 Online Bachelor of Business Administration Degree Programs of 2011." The Management program gives graduates the know-how to effectively and efficiently manage people, methods, materials, equipment, and money to gain a solid foundation in business that prepares them for the many opportunities and challenges that exist in the new economy and the e-business age. The program focuses on entrepreneurial leadership, effective communication, technology mastery, critical thinking, and teamwork. Our distinct balance of theory and hands-on application, along with an applied internship, prepare you for a career connection. An understanding of local, regional, and global economic structures. An applied and technology rich teaching and learning environment with a strong emphasis on current managerial practice, the study of management foundations, real time case and business situational discovery, and domestic and global business exposure, that provides students with the computing and analytical tools needed to meet the quantitative demands of managing. Flexibility to consider elective courses or a minor from multiple disciplines so that additional specialization in personal areas of interest are possible. UMC has an excellent placement record for graduates in Management. We have professional, enthusiastic educators with industry experience who can give individualized attention to student needs. A Management minor available online. Tia Leaf is a 2014 graduate with a degree in Business Management and a minor in Marketing. Tia chose UMC online because of the cost, reputation, and degree options. More about this article here. Senior Tiffany Gerhart, an online management major at the University of Minnesota Crookston talks about her experience in "Online Learning Takes Discipline and Motivation" from the Spring 2014 version of the Torch magazine. Alisha Hillstrom, 2012, talks about her experience as an online Business Management major in the Fall 2011 Torch article "Online Learning Leads to Visit" . Sarah Domoradski, 2009, graduate of the Bachelor of Science in Business talks about her experience at the University of Minnesota Crookston taking classes initially on-campus and then moved to the online version of the program. The Management program prepares students with a foundational understanding of the management role in planning, organizing, leading, and controlling the resources of organizations. This is accomplished with a creative and adaptable curriculum, supported by co-curricular and extracurricular activities, which prepares learners to meet demands of evolving world economies and employers. 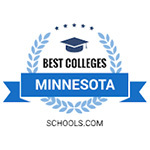 Earn a prestigious University of Minnesota degree in an affordable, close-knit campus setting. The University of Minnesota is one of the most comprehensive public universities in the United States and ranks among the most esteemed. As a coordinate campus of the University of Minnesota system, the U of M, Online offers access to world-class teaching, learning and research resources, as well as enhanced internship and undergraduate research opportunities. As a graduate, your diploma features one of the most respected names in higher education. You expect an education that not only focuses on your needs but also allows your talent and interests to shine through. The dedicated faculty and staff at the U of M, Online serve as true mentors, offering prompt personalized attention catered to an online learner. You will have the opportunity to communicate with advisers and other students by participating in discussions, and other interactive tools to give you an exceptional educational experience. The University of Minnesota, Online allows you to learn anywhere, anytime. You will have the flexibility to access your courses 24/7 without having to worry about leaving work or home to get to class. The U of M, Online utilizes a broad variety of technological tools that make learning online easy! Employers consistently report that the U of M, Online graduates they hire are extremely well prepared for the demands of today's technological workplace. As a University of Minnesota, Online student, you have the opportunity to study abroad! The U of M, Online through the Crookston campus has made it a priority to promote an understanding of diversity and global perspectives and to offer you the resources, programs and activities necessary for you to succeed in today's global economy. Our international recruitment efforts bring students from more than 20 countries, and our Study Abroad program offers more than 300 opportunities for you to study in 67 different countries. There are also numerous cultural activities and clubs to participate in. We offer many ways for you to expand your worldview, gain international experience, and make connections with people from across the globe. Learn and do! Online learners have the opportunity to participate in hands on internships. Our internship programs give you the chance to practice the principles and theories you've learned in your courses and make contacts with potential employers that are near you. The Undergraduate Research Opportunities Program (UROP) is also available to all students and allows online learners to design and conduct research as an undergraduate! The U of M, Crookston is the affordable choice for anyone! Whether you live just across the border, across the country or on the other side of the ocean, you pay the same as those who live in Minnesota. We offer an incredible value that's also extremely transfer-friendly. Our staff will work with you to make sure your credits count. Our faculty advisers will personally talk with you about career goals, degree interests and review your records to develop a plan, and our transfer specialist will help make the process as smooth as possible. The Crookston campus has a reputation for a job placement rate of more than 93% for students in their field of study within six months of graduation. Some programs on our campus have even a higher rate of placement.